MOSCOW -- Russia's military on Tuesday successfully test-fired a new intercontinental ballistic missile capable of carrying multiple nuclear warheads -- a weapon intended to replace aging Soviet-era missiles. The RS-24 missile was launched from the Plesetsk launch facility in northern Russia and its test warheads successfully hit designated targets on the Kura testing range on the Kamchatka Peninsula some 4,340 miles east, Strategic Missile Forces spokesman Alexander Vovk said. 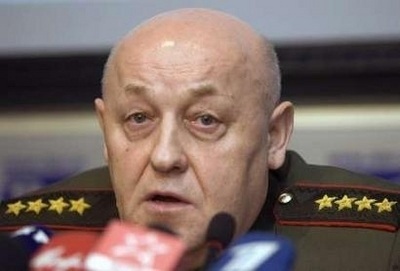 Vovk said that the missile carried multiple test warheads, but refused to say how many. The Interfax news agency said the RS-24 is capable of carrying at least three warheads. The Strategic Missile Forces said in a statement that the missile was launched from a mobile launcher. It said the new missile was based on the Topol-M and built by the same design team -- Moscow's Heat Technology Institute led by Yuri Solomonov. The RS-24 was first test-fired successfully in May. "This missile is being created using scientific and technological solutions from the Topol-M missile which allows to significantly reduce time and cost of its development," the statement said. Existing Topol-M missiles carry a single nuclear warhead and are capable of hitting targets more than 6,000 miles away. The Strategic Missile Forces said the RS-24 missile is designed to replace Soviet-built missiles with multiple nuclear warheads, such as RS-18 and RS-20. Those missiles are known in the West as the SS-19 Stiletto and the SS-18 Satan. "The RS-24's deployment will strengthen the Strategic Missile Forces' capability to penetrate missile defense systems and strengthen the nuclear deterrent potential of Russia's strategic nuclear forces," the statement said. "The RS-24 will form the backbone of the Strategic Missile Forces and safely ensure the security of Russia and its allies through the mid-century." President Vladimir Putin has used windfall oil revenues to modernize Russia's military arsenals amid increasing tensions with the West. The Kremlin has fiercely opposed US plans to deploy missile defense sites in Poland and the Czech Republic, saying they threaten Russia's security.